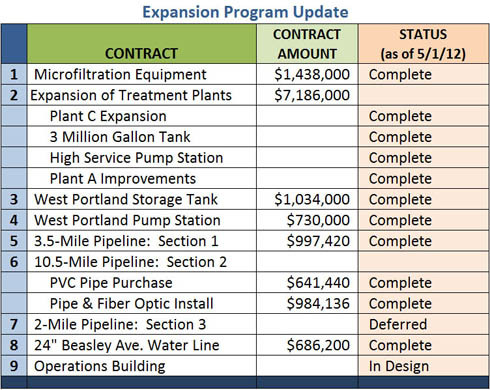 Construction on the Water District's overall water system expansion program projects started in 2009 are now complete. The District issued revenue bonds in 2009 to fund the expansion program which has an estimated overall cost of approximately $18 million. The program has increased capacity and enhanced reliability in the Water District’s system. The improvements provide the District with greater control over delivered drinking water quality than was previously possible. A small pipeline extension west of Odem has been deferred and a new main operations building is being reviewed to reduce projected cost. When San Patricio Municipal Water District customers set an all-time record high for drinking water consumption of 13.6 million gallons on a single day in 2009 it illustrated the importance of continued incremental expansion of district capacity. Planning for the overall system expansion had been underway for several years before the District moved ahead with the projects. A constant for the District over the past 60 years has been the inevitable need to accommodate growth and changing customer requirements. Over the past two decades care has been taken to insure that the District's raw water, treatment and delivery systems remain flexible and be designed to accommodate these changes and to allow cost-effective incremental expansion. In addition to keeping pace with demand, the expansion projects were needed to meet ever more stringent drinking water quality standards and to deal with the deteriorated condition of a major water transmission line that has been in service since 1952. A $1.33 million contract was awarded in September 2009 to Pall Corp. to provide microfilter membrane modules and additional equipment for expansion of Plant C, the District’s ultramodern microfiltration facility. The SPMWD Board of Directors awarded a $7.2 million contract in October 2009 to CSA Construction of Houston to make a series of improvements at the District’s treatment complex. This included expansion of Plant C, new on-site piping and controls, a 3 million gallon water storage tank, the new high service pump station and settling basin upgrades. Plant C's rated capacity has been increased from 12 to 16 million gallons per day as part of the expansion. The District will also be working to have the capacity of Plant C re-rated. It is expected to have a working capacity of 21 mgd in the future when additional flocculation/sedimentation basins are added. The plant is designed for incremental expansion as needed and has been expanded several times since it was initially put in service in 1999 with a capacity of 7.8 million gallons per day.. In 2010, the contractor completed the imposing 3 million gallon prestressed concrete ground storage tank on the eastern edge of the SPMWD treatment complex. The tank is similar in design and construction to a nearby 3 million gallon ground storage tank built in 1979. The older tank is undergoing upgrades that include a baffle system, repairs and painting. Nearby the new high service pump station is operational and moving treated water to customer delivery points. Work on a new direct-drive diesel powered backup pump within the station was delayed but is now complete. Several projects have expanded the District’s 30-mile-wide water delivery system. In order to provide Portland, Taft, Odem, and Rincom Water Supply Corp. with water treated at the District's treatment complex a new west side transmission system had to be installed. The first element of this system is a new West Portland Pump Station located between Portland and Taft. It includes a new 2 million gallon treated water ground storage tank. Both are now operational. The concrete tank was built by Preload, Inc., a national tank builder, under a $1 million contract awarded in November 2009. The pump station was built by Holloman Corp. of San Antonio under a $730,100 contract awarded in May 2010. The second part of the new west side system is the new West Transmission Line. This line effectively replaced the 1952 pipeline which now serves Seaboard Water Supply Corp. and serves as backup capacity. Section 1 was built by Island Construction, L.P., the low bidder at $997,420. Section 2 was built under a $984,100 contract by Bridges Specialties using pipe purchased separately under a $641,400 contract. On the east side of the District's distribution system, a one-mile 24-inch pipeline has been installed to provide better service to Aransas Pass and Port Aransas. The new Beasley Avenue Water Line creates a loop in the system between Avenue A and SH 361 on the north side of Ingleside. The line is tied to a 5-acre tract on Avenue A that will be the site of a future pump station and storage tank serving additional demand in Aransas Pass and the Rockport area. The new pipeline was built by H&G Contractors and the street repaving was done by J.K. Weaver Construction.